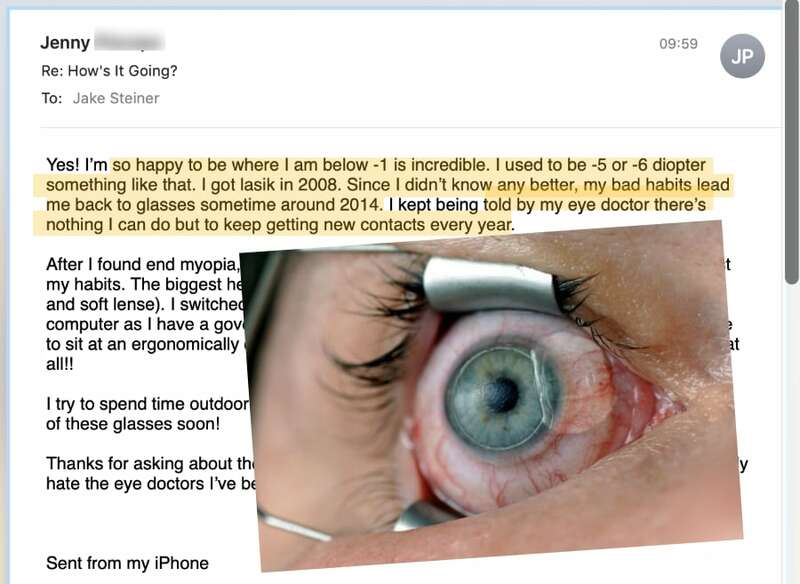 Let’s talk about an issue sometimes brought up online, on why endmyopia is “bad”. 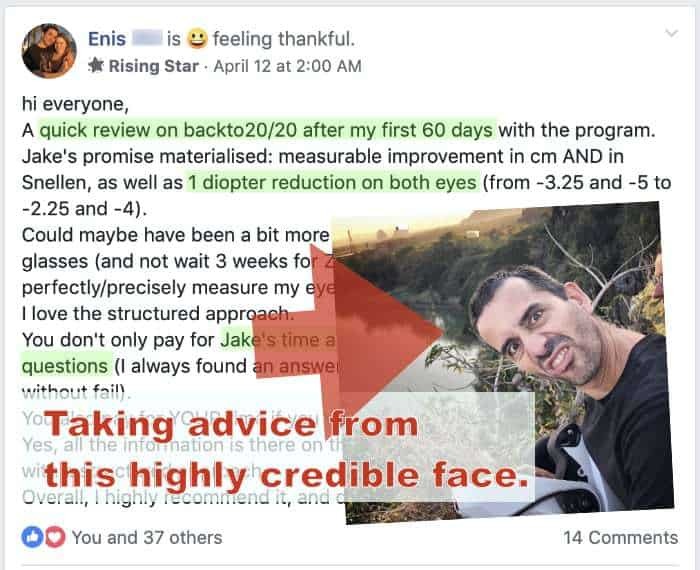 You can’t trust Jake and endmyopia and the whole method and approach, because Jake charges money. It’s not free, ergo it’s not good. To which my first, unedited reaction is, who are these people, f*cking communists?! The Internet having developed on top of an advertising model, and most benefits on the surface appearing to be free, in my opinion is a massive problem that affects all of us significantly. Facebook is “free”, and see how well that works out for us. Their entire business model is based on exploiting you as much as possible, and exposing you to advertisers as efficiently as possible. They short circuit your social wiring and turn you into a screen addict, for profit. Same for Google, do we really feel this is a good thing, this giant corporation sucking up any and all information, into a black hole of a for-profit motive? EVERYTHING needs to make money, ultimately. There’s no free ride. A huge one, not to be understated, is how journalism is being killed by the whole “must be free or it ain’t no good” model of the Internet. Anyone who doesn’t grasp where we’re going as far as understanding the world around us (in a not good way), in my book is at best ill informed, or more likely not using their brain to good advantage. Here’s the deal, if it must be spelled out: DON’T TRUST FREE STUFF. Like I say above, everything needs to make money. Why? Because everything costs money. How would anyone run a resource of this magnitude, with millions of visitors and a heavy demand of hours every day, and also pay for it to operate? Unless you’re an incredibly altruistic trust fund recipient, it’s just not likely. So then let’s move on to money, and making it. You should trust people who charge you money. You have an obvious way to hold them accountable, and they have incentive to live up to a clear and transparent deal that you are making. 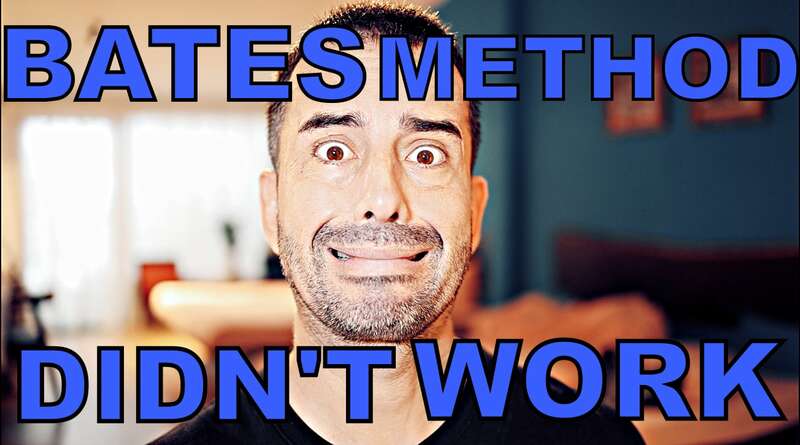 Think of it this way: Would you like to go to a free dentist? That would raise no red flags at all? Also this whole explanation feels like it’s tailored to those with too few functioning brain cells. I’m hoping that you saw the title and are only reading out of mildly amused curiosity, because you’re not in need of basic explanations of how the world works. Is Apple evil because it makes money? Apple makes money because it creates a product that people are willing to pay for. Money is a significant motivator to make something awesome. The question shouldn’t be about free vs. not free, but about value. Bankers make tons of money, and one might argue that we should hang them all from tall trees, and be done with much of that whole industry (not that I’d condone any such thing). Ironically, much of your favorite eye gurus own efforts come from the finance world, and most certainly we don’t create much value for most people, in exchange for massive rewards. Apple perhaps deserves the money, and bankers probably don’t. So the question really should be, is it money worth paying. Do I want to spend money for this. And that’s where the ‘free’ part comes in. How’s that for a massive contradiction for all that I just explained? But the contradiction isn’t actually one. If you ask about motivation, it boils down to the somewhat simple reality that I’m not in a position to give away several hours every single day while also actively losing money paying the bills that endmyopia creates. I have a family, a young child, outdoor hobbies, I don’t like to sit in front of screens. If I do endmyopia for free, I’ll also have to spend MORE time in front of screens at some other job to pay for endmyopia – the contractors, hosting bills, software, lawyer, other professionals, etc etc etc (never ending bills, for a seemingly simple thing). So yes. Not being out of my tiny little mind, there is a component of endmyopia that is free, and one that isn’t. Endmyopia has to make money, in order to also be available for free. As it turns out I can afford to make everything available for free, because there are also enough people out there willing to make up for the ‘free’ stuff by paying for 1) my time for one-on-one support and 2) a structured approach I spend a lot of time tweaking and improving for participants. Endmyopia is free, because some people opt to pay for Jake’s time. It’s kind of a simple premise. It could call go a totally different way, though. 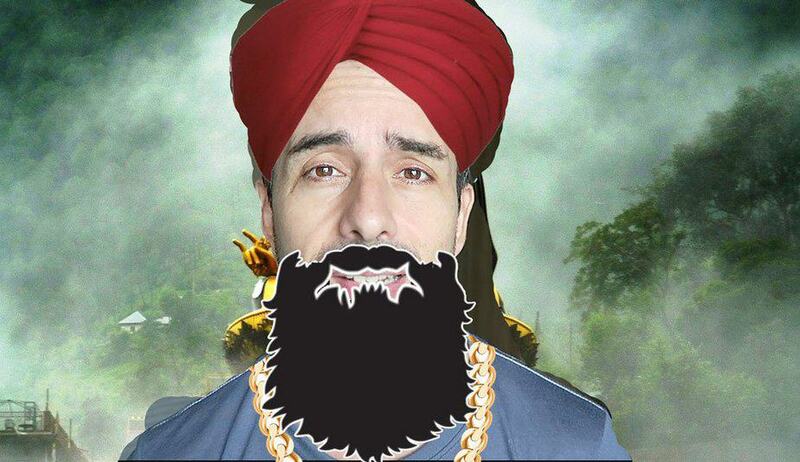 Your favorite half wit eye guru likes to invest in businesses. It’s kind of one of my favorite hobbies. Understanding what makes money, and why and how, and how to improve it. It’s something I’m genuinely good at (so say the profits, anyway). While untested, I have a hunch that endmyopia could make way, way more money by not being free. Rather than relying on a very small percentage of participants who pay for support and structure, I could only put out improvement reports. Put up a pay wall around everything else. Pay for ads, focus on marketing, offer the outcome of paid 20/20 gains with some kind of strong guarantee. Everyone who can pay but right now enjoys just using the free resources, would have the option to either pay, or basically not have access to the massive library of hundreds of how-to guides, detailed reports of progress (and how it was accomplished), many hours of video, measuring tools, and everything else we offer here. 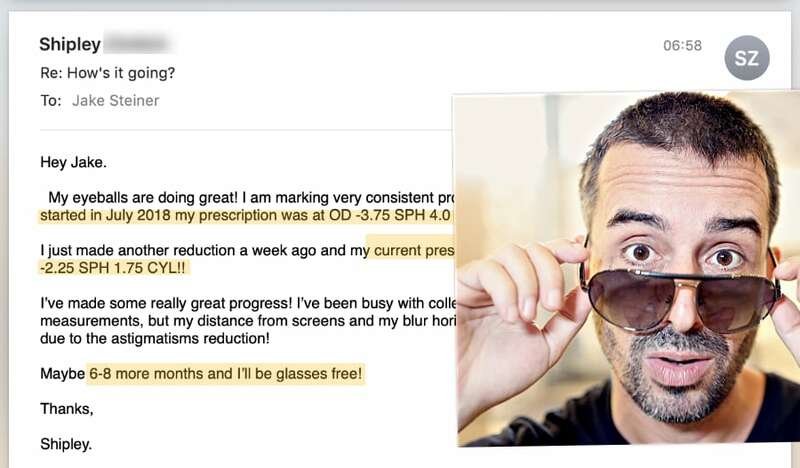 It’s quite likely that endmyopia would have more paying customers, if it wasn’t largely free at this point. A lot of the effort going right now towards making free resources, could go to marketing and promotion. That’s a significant amount of time that could be better spent to generate money. Sure not everyone would pay. But having a few payment tiers, some inexpensive enough to make it worthwhile for just about anyone, would very likely work quite well. 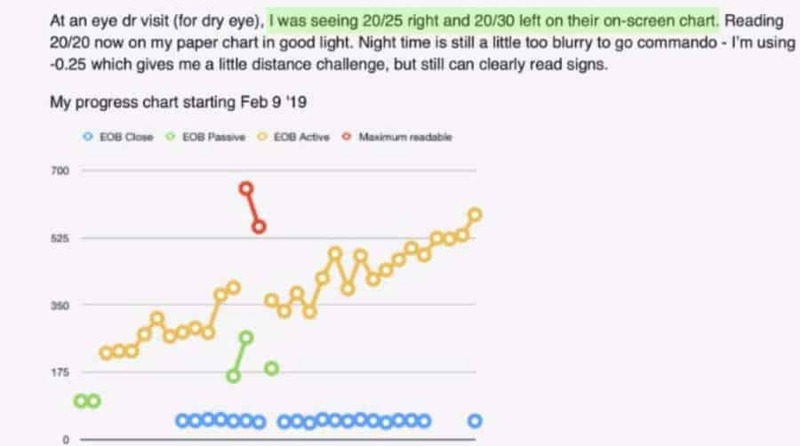 How many people would pay $20, $30, $40 a month for access to hundreds of guides and a large community of fellow myopes reducing their lens dependence? And think of all the obvious aspects. What’s my financial upside in moderating a 12,000+ member Facebook group, for free? Putting out 150+ videos on Youtube, free? Spending many hundreds of hours writing how-to guides? The primary motivation here isn’t profit, which should be quite obvious to anyone taking a moment to think about it. People complain that not only is there a way to pay for one-on-one support and structure (ie. “it’s not free) but also that all the free resources are “hard to organize by oneself”. These things drive my blood to boil, and honestly if that’s how we all thought, we’d still be living in caves. Everything has a cost, and if somebody is doing all the work for you, what’s their incentive? Imagine if enough people were to complain online that endmyopia costs money. At some point this would incentivize ole Jake to realize that the people complaining add nothing of value to the resource (they wouldn’t pay anyway and all they are doing is complaining) , and that in fact we’d all be better off if the resource simply wasn’t free. I’ll make good money, and whoever was going to pay anyway, will get great results as promised – and all the freeloaders are doing nothing for either Jake or endmyopia, so let’s just close the door on them. Enjoy your myopia, guys. Go find some free sh*t games to play online and check that Instagram feed. What keeps endmyopia content available for free, is your feedback. You get improvements, you let me know, I feel good about helping out. You post positive reviews online, you share your experience, you show me that we’re all in this together, and it’s not about free or paid, but rather all of us having a great experience. 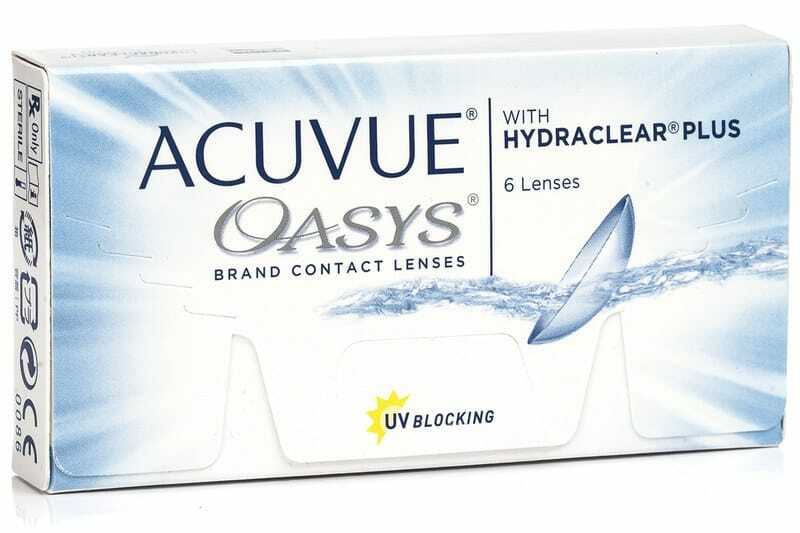 We’re all sharing a small planet, we’re all surrounded by profit hungry corporations, for profit optometry is taking our eyesight and selling it back to us via lens subscriptions. What if more of us were to take a little time to learn things of value, and share them? What if we spend more time looking for balance – yes we need to make money, but how can we do it while imparting a greater benefit on those around us? It’s really up to you. Your voice counts, here. I know I can turn endmyopia into a good money maker by closing the door and making it “members only”. I haven’t done so because of feedback of participants just like yourself. I’m being a bit of a hippie, trying to balance money and benefit. Endmyopia makes some money – less than it probably could, though enough to keep the bills paid. I do still need your help in keeping my own sanity, as well as the collective benefit of the “free” aspects that so many participants rely on. Please share your experiences. 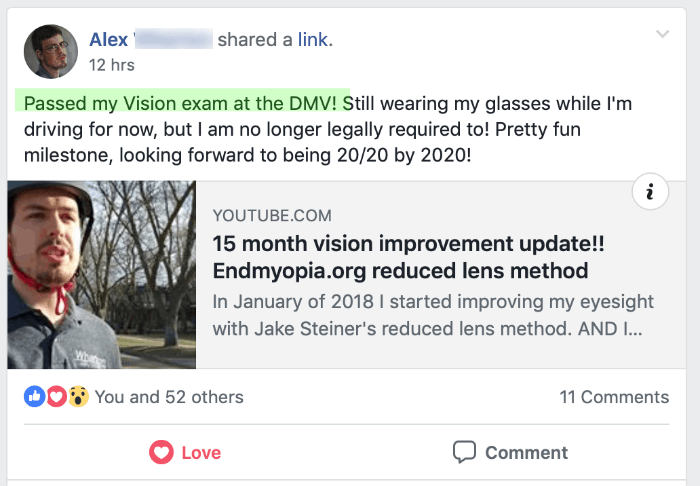 Help make sure that endmyopia makes a good impression on new readers, by being vocal about all your 20/20 gains!